The right to return to one’s country is customary law and is enshrined in several international instruments, including Article 13(2) of the Universal Declaration of Human Rights; Article 5 (d)(ii) of the International Convention on the Elimination of all forms of Racial Discrimination; Article 12(4) of the International Covenant on Civil and Political Rights. Significantly, the International Convention on the Suppression and Punishment of the Crime of Apartheid includes the denial of “the right to leave and to return to their [members of a racial group/s] country, the right to a nationality, the right to freedom of movement and residence,…” as constitutive factors demonstrating the crime against apartheid. Under this legal framework, the ongoing denial of the Palestinian right to return is an act of apartheid, which is a crime against humanity. The right is also well established through international relations practice/State practice as evidenced by the comprehensive return of refugees to Bosnia, East Timor, Kosovo, and Rwanda in the aftermath of military conflict. Nonetheless, Israel has intransigently rejected its application and scope. 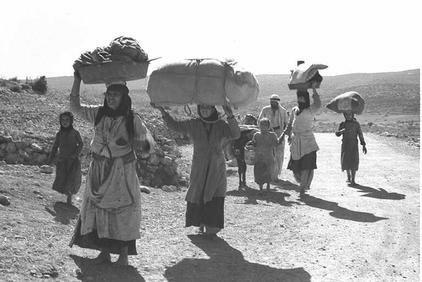 Israel considers the right of Palestinian refugees to return to their place of habitual residence as an ‘act of Suicide’ because the influx of millions of Palestinian refugees would disrupt its tenuous Jewish majority. In an attempt to evade legal accountability, Israel cites UN Security Council Resolutions 242 and 338, which mandate a political solution to achieve a just settlement to the refugee problem, as authoritative. De-coupled from Resolution 194, Resolutions 242 and 338 subject the resolution of the refugee problem to political expediencies without consideration of human rights norms and principles of justice. The removal of the refugee question from an international platform and its confinement to bilateral negotiations has had devastating repercussions for refugees. The contested notion of “justice,” coupled with the triumph of political expediency over two decades of the Oslo Peace Process, has made nearly every aspect of the inalienable individual and collective right to return a matter of controversy. Israel denies all moral responsibility for the refugee problem and argues that it is the responsibility of the international community and Arab States to integrate or resettle them outside of its borders and to compensate refugees for their material loss. Israel considers the right to return to their place of habitual residence as a matter of privilege rather than right. Such proposals infringe upon the well-established principle of voluntariness, which guarantees every refugee his/her right to choose freely one of the durable solutions (return, integration or resettlement). The Peace Process has also failed to address the protection gaps endured by Palestinian refugees. In its enactment of Resolution 194, UNGA created a unique regime for protecting Palestinian refugees to whom it owed special responsibility. Accordingly, it established the UNCCP with the mandate to provide Palestinian refugees with both comprehensive international protection and a durable solution to the refugee problem. Unable to find a durable solution acceptable to all parties, the UNCCP ceased its operation in the early fifties, signalling the failure of the special regime. Although UNRWA is still providing Palestinian refugees with humanitarian relief in its five operational areas, no other agency has hitherto been empowered to provide legal protection to Palestinian refugees and to find a durable solution. This has had devastating consequences for vulnerable refugee populations who are left without the protection to which they are entitled. Stripped of the legal authority and the moral underpinnings of international law, the right of return, which impacts on the humanitarian conditions of 6.5 million Palestinians, and the collective self-determination of the Palestinian people, has been severely compromised. Inspired by the Arab Spring, on Nakba day this year, Palestinian refugees in Syria, Jordan , Egypt and Lebanon, as well as those within the Occupied Territory, marched towards their respective borders with their homeland, in an expression of their determination to see their right to return implemented. This show of steadfastness was met with Israeli aggression, resulting in dozens of fatalities and hundreds of injuries. This protest at their forcible displacement and exclusion was repeated less than a month later, on Naksa day, June 15th. These events are illustrative of the demand of Palestinian refugees for their right of return and the urgency of its implementation. On this 63rd anniversary of Resolution 194, BADIL calls upon the international community to affirm the right of return by resurrecting mechanisms aimed at its implementation and at bridging the outstanding protection gaps regarding refugees, as steps towards a durable solution. Badil calls upon the PLO to activate Arab League Resolution 5414/1994, aimed at reviving the UNCCP in order to close the protection gaps and establish mechanisms for implementing UNGA Res. 194.